Humble AFC Stanground Sports manager Rob Ames is keeping his feet firmly on the ground despite a remarkable turn around i n his club’s fortunes. Last season the city side lost their first seven Peterborough Premier Division matches. AFC Stanground manager Rob Ames. 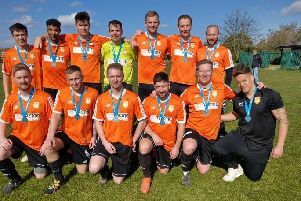 This season Ames has led them to third place, a position they consolidated with a 2-0 win over Leverington last weekend with goals from Luke Bonney and Nicky Butler. “I would have been happy with a top 10 finish when the season started,” Ames said. “But now I think top six is achievable. “I’m so proud of everyone at the club as we had a terrible start to our first season at this level. To turn it around so well, so quickly is a great credit to the club. “We did sign some good players in the summer, but we’ve done even better than I dared believe. Stanground chase an eighth win in 11 matches when travelling to face Holbeach United Reserves tomorrow (October 8). They then host reigning champions and current leaders Moulton Harrox before tackling Godmanchester Reserves in a Hunts Cup tie. Ames hopes marquee summer signing Jamie Graham will be fit to make his club debut against Godmanchester. Ames believes Peterborough Sports Reseves will be the team to beat in the Premier Division this season. They re-inforced that view by winning 4-1 at Harrox last weekend. Sports, who have been in free-scoring form, could well bag another hatful when lowly Uppingham Reserves visit PSL tomorrow. There are a couple of big games tomorrow as Harrox travel to local rivals Pinchbeck United and second-placed Netherton United entertain fourth-placed Ketton at the Grange. Peterborough Sports Res v Uppingham Town. Pinchbeck United v Moulton Harrox. Cambridge University Press v Wisbech Town Res.